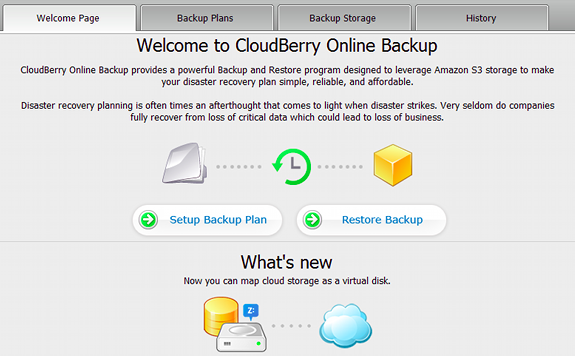 CloudBerry is a backup service that is ideal for personal use, as well as business environments. It is one of the main solutions offered by CloudBerry Lab, a company dedicated to create a cross-platform backup solution that works on Windows, Mac and Linux systems. 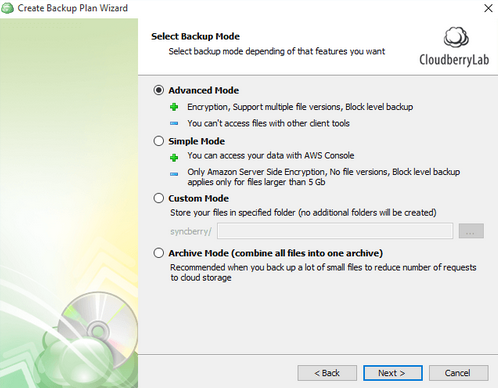 It is important to note that CloudBerry Backup doesn’t offer cloud storage space itself, but it is a versatile tool that allows you to back up and organize your data with a variety of cloud storage providers, including Amazon S3 and Microsoft Azure. Before we talk about their features, let’s take a look at their pricing. Their service caters for both individual and corporate users, but it is clear that they have invested a lot of effort creating advanced solutions for businesses. In order to make things easier for business users who need to figure out their total costs, CloudBerry offers a price calculator. This practical tool will allow you to work out your total license cost, amount of storage space, storage cost per month based on the license you have, and more. CloudBerry also has a free account, suitable for personal use on your desktop. You can manage up to 200GB of data, without time limit. It doesn’t support encryption or compression, but it is a good introduction to the service and will allow you to check its features before upgrading to a paid plan. These are just a few of the providers their software works with. There are 30 different services that can be used to store and send your data, several of which I have never even heard of before. The version you select determines which features you get. For instance, you would have to purchase the MS SQL version in order to backup a MS SQL Server. But that makes a lot of sense, and I think that the fact that the features are organized into various packages, helps you to decide which plan is right for you. 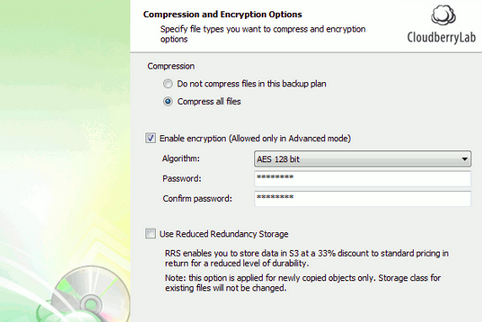 In addition, they have all the usual options with regards to backup types. You can backup individual files and folders manually, create entire disk images, and perform incremental and differential backups. They seem to allow almost every backup destination imaginable with two exceptions. There’s no support for Blu-Ray or CD/DVD backups. Although the software can only backup data sets that are 1TB or smaller, that should be more than enough for the majority of users. CloudBerry has good restore features as well. Users have 3 main ways to restore their files. First, you can choose to simply restore the latest and greatest version of a file or backup. Alternatively, you can opt to restore a backup given a certain point in time, which is useful if you’ve been affected by a virus or malware. Lastly, you can simply choose to manually restore files at your discretion. CloudBerry has better security than many other backup solutions, and that’s saying something. They have a multitude of different encryption options, one of them being server-side encryption. CloudBerry can protect your backups using AES-256 and AES-128 encryption (among others), and it can even encrypt your data locally before sending it to the storage server. In the cloud industry, local encryption is known as client-side encryption, and it’s the most secure. Given that you choose and manage your own encryption key, there’s nothing the storage provider can do to read your data. CloudBerry has cool features and fantastic encryption options, but their customer support could be improved. Naturally, they do provide documentation, guides, video tutorials, forums and other useful support resources. However, there are limited options to contact their technical support. There isn’t a live chat feature or a phone number. Free users can only get assistance through the forum and all other users can use the email support system, which promises replies within 48 hours. There is a Diagnostic tool that creates a support ticket automatically when you come across an error. The ticket will include details of the issue, which is handy as you won’t need to spend too much time explaining what is happening. While the email support and forums are helpful, I would like to see additional options to get in touch with their team. A live chat would be ideal, particularly for urgent issues. CloudBerry is a secure and effective alternative to manage online storage and backup services more effectively. I was impressed with the wide variety of services they work with and the different encryption options supported. Their prices are reasonable and you can choose the plan that covers the specific functionality that you need. They have a good set of backup features and offer a high level of security. Since CloudBerry is compatible with so many different storage providers, you don’t have to stick to your backup provider’s storage servers. All in all, I think they offer an excellent backup and file management service with plenty of great features – the most notable of which are ease of use, strong encryption and the freedom to choose your own storage provider.